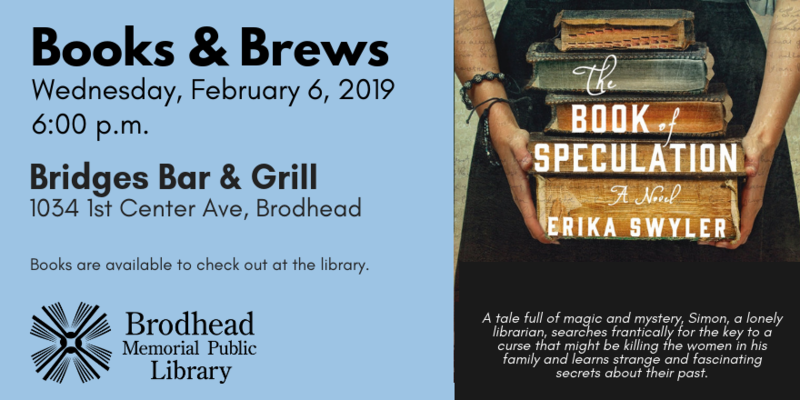 Brodhead Memorial Public Library's new quarterly book group "Books & Brews" will meet Wednesday, February 6, 2019 from 6:00 - 7:30 p.m. at Bridges Bar & Grill, 1034 1st Center Avenue, Brodhead. This quarter's selection, "The Book of Speculation" by Erika Swyler is a sweeping and captivating novel about a young librarian who is sent a mysterious old book. Simon Watson lives along on the Long Island Sound in his family home, a house perched on the edge of a cliff that is slowly crumbling into the sea. His parents are long dead, his mother having drowned in the water his house overlooks. One day, Simon receives a mysterious book from an antiquarian bookseller; it has been sent to him because it is inscribed with the name Verona Bonn, Simon's grandmother. Simon must unlock the mysteries of the books, and decode his family history before fate deals its next deadly hand. "The Book of Speculation" is a gorgeous, moving, and wondrous novel about the power of books, family, and magic. Copies of the book may be check out at the library. Large print and audio versions are available.